I get so resentful when I don’t get any sewing time. And I don’t sport a good grumpy look either. So with back-to-back work deadlines this month, I needed to find a little sewing project that I could tap into in between marathon stints in front of the screen to retain balance and sanity… for everyone concerned! #sewdots was brought to my attention on Instagram. Instigated by the brilliant Rosie of DIY Couture and writer of No Patterns Needed. She also works for the RNIB – Royal National Institute for the Blind – where she learned about their campaign that runs every October called Wear Dots Raise Lots. It highlights the impact of Braille and raises money for their services. 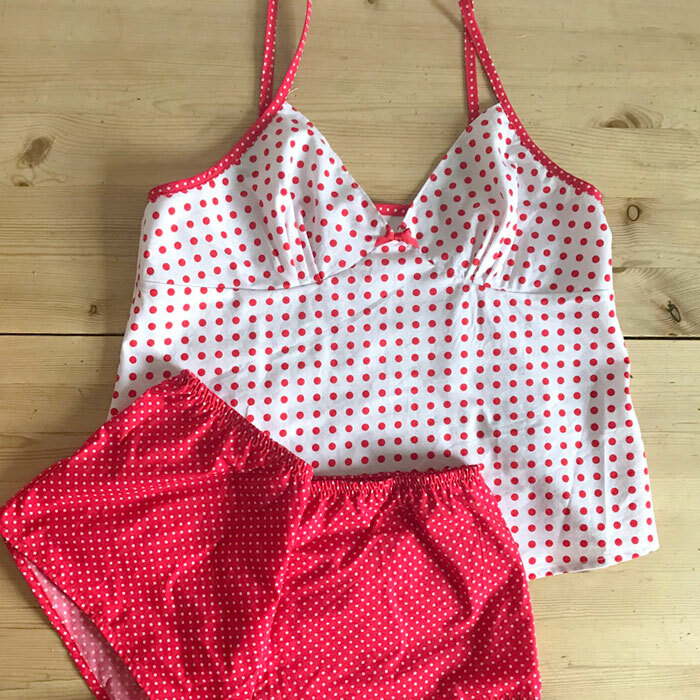 It encourages the wearing of dots to raise awareness, encouraging people to hold dotty parties, or coordinate with colleagues and pick a ‘wear dots’ day for the office. 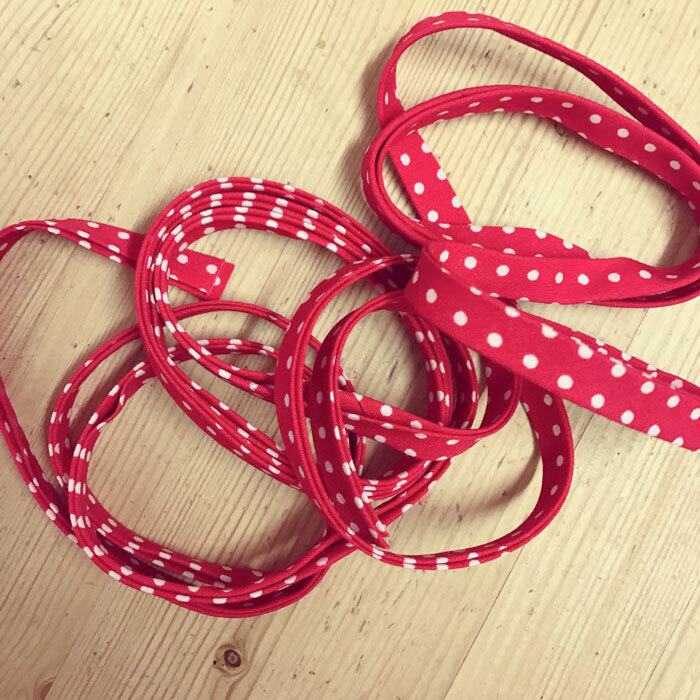 So Rosie has upped the ante to encourage the sewing of dots too! The idea was to use fabric from stash and donate what you would have spent via the JustGiving page she has set up. Simples! This was all shaping up nicely. 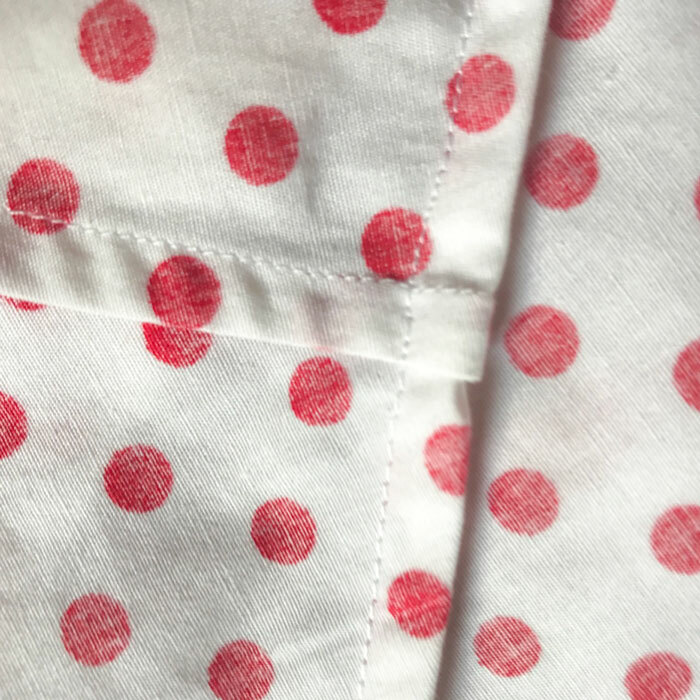 I had two pieces of coordinating red and white polkadot fabric. And I had a Tilly and the Buttons Fifi pyjama pattern on my to do list. A pattern that needs little space to cut out and can certainly be achieved in manageable chunks of sewing time. The Shorts took 40 mins, including cutting out time. And including unpicking my first elastic attachment! The camisole happened a week later… over 3 days: The cutting and stay stitching in one shift, the main body sections sewn together in another, and the binding made and sewn on before work one morning. I sewed on the bow and attached the back straps just now! But I’m sure if you had dedicated and uninterrupted sewing time, you could easily rustle this set up in a couple of hours. This is such a neat and gratifying garment to make. all the seams are ‘Frenched’ and it’s as neat inside as it is out. It really doesn’t need much fabric and if you are lucky enough to have coordinating scraps, the design possibilities are endless. And to boot, I have a lovely set of PJs at last! It appears I’ve made them for everyone in the household except me. I know they are slightly out of season but I really don’t care. I’m going to make more. Theres still days left this month if you’d like to participate. There’s some great prizes up for grabs too! Doesn’t have to be a garment of course. Could be a much smaller project still, like a sleep mask or a headband or a scarf! I can totally assure you that sewing and giving is a great self-indulgent, feel-good combo too. Good work Rosie! Thank you Caroline. I love your skirt and cool Notting Hill shots too! Vintage Butterick coat with added sparkle! My date with Zandra Rhodes plus a FREE GIVEAWAY to the Spring Knitting and Stitching Show 2019! Why buy a dressform, tailors dummy, mannequin, dressmaker’s stand thing?